Scuba diving computers are becoming more and more common everyday. For many divers their scuba computer is their first piece of scuba equipment that they purchase. 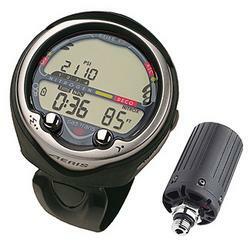 Your dive computer combines your depth gauge, timers, and it may contain your SPG into a single instrument. Your dive computer applies your current depth and time information into a decompression model to track nitrogen that dissolves into you body during a dive (nitrogen loading). Once your dive profile is loaded into a decompression model, your dive computer can than tell you how much time you have left at the particular depth you are at. This can be done with dive tables, but your dive computer is much more efficient, so you will experience more dive time. If your dive computer contains an integrated SPG, than your computer will be able to estimated how much time you have based on air consumption not just nitrogen loading (dive tables). These are called Air Integrated Diving Computers. Some of the newer air integration computers can accommodate a wireless transmitter to transmit the air pressure from the tank. This type of scuba computer will eliminate the need for a hose coming off of your regulator. Oceanic VT3 dive computer is a great example of these computers. Nitrox dive computers have the capability to calculate your nitrogen loading based on air mixtures where the Oxygen percentages can go from 21% all the way u to 99%. Yes, there are even tri-mix computers where the mixture of Oxygen, Nitrogen, and Helium can be tracked in a special tri-mix decompression model.